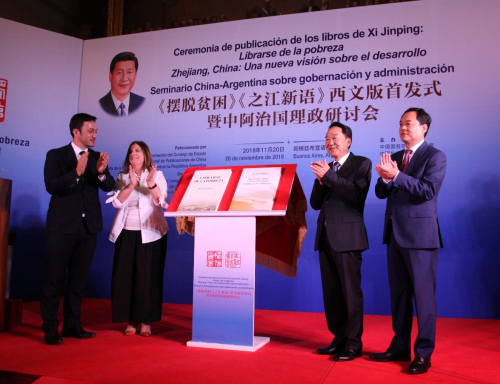 A ceremony was held on Nov. 20 in Buenos Aires, Argentina, to launch the Spanish versions of two of Chinese President Xi Jinping's books – "Up and Out of Poverty" and "Zhejiang, China: A New Vision on Development." The event was named "China-Argentina Seminar on Governance and Administration" and jointly organized by China's State Council Information Office, China International Publishing Group and the Chinese Embassy in Argentina. In his speech, Jiang Jianguo, deputy head of the Publicity Department of the Central Committee of the Communist Party of China (CPC), said the two books are mainly about the explorations and thoughts of Xi during his tenures in Fujian province and Zhejiang province. By summing up his ideas on regional administration, poverty alleviation and development, the two books shed light on Xi's thoughts on governance. Jiang said that China and Argentina share a lot of common ground as developing countries and emerging markets. He said that the publishing of the two books in Spanish will help more people in Argentina and other Spanish-speaking regions to better understand China, and it will add new vitality to the two countries' friendship and cooperation. Luis Petri, deputy president of the House of Deputies of Argentina, said in his speech that the Spanish versions of the two books are of great significance. For Argentina, the fight against poverty is an important agenda of the government, and these two books by the Chinese president can provide valuable reference. From 2012 to 2017, decisive progress was made in China's campaign of targeted poverty alleviation, with poor population reduced by more than 68 million, and the poverty headcount ratio dropping from 10.2 percent before the 18th National Congress of the CPC to 3.1 percent today.